Rowley Eardwulf is a Breton merchant at the Wawnet Inn. He only appears after you buy the Vile Lair official plug-in. He has 2000 available gold and sells weapons, enchanted armor, and upgrades for Deepscorn Hollow. He also provides training in Sneak up to level 50. 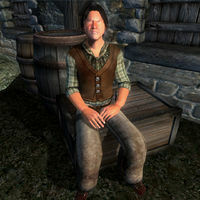 According to Greywyn's Journal, Rowley was a former member of the Dark Brotherhood who aided Greywyn in his dark plan to destroy the Black Hand with an army of Vampires. He escaped the Brotherhood's wrath when the sanctuary was "purified", and is the only surviving member of the Crimson Scars. Rowley never sleeps; instead, he spends all night sitting on the stairs in the Wawnet Inn, where he will offer training and bartering. At midday he will dine on mutton for two hours at one of the downstairs tables. At 2pm he will return to sitting on the stairs, and will stay there until 8pm when he has a three-hour dinner, again eating mutton. At 11pm he will once again return to his seat on the stairs, keeping vigil throughout the night. He wears a plaid shirt, light brown linens and a pair of quilted shoes. He is armed with a leveled dagger and always carries some mutton. When you achieve Expert level in Mercantile you can invest in his shop. This makes Rowley the merchant with the most gold available in the game, along with Nilphas Omellian and Aurelinwae. When spoken to, Rowley offers the greeting, "You need something... special? Check out my wares. You won't find this stuff at your local general store, that's for damn sure." This same greeting is used by another Breton merchant, Shady Sam, who hangs around the Imperial City. Rowley's hello when the player is near ("Psst. Hey, you! Yeah, you! Come here! I got what you need...") and greeting when the player talks to him ("You need something... special? Check out my wares. You won't find this stuff at your local general store, that's for damn sure.") are misleadingly used all the time, even when he is not buying or selling anything, causing players to think that they've run into a bug with him. He will only trade when sitting on the stairs in Wawnet Inn, or when he's eating on the ground floor. However, if he is sitting on the stairs, and is buying and selling, but the Deepscorn Hollow upgrades are not available in his inventory, this could be the unrelated Deepscorn items bug. Esta página foi modificada pela última vez à(s) 02h36min de 27 de janeiro de 2015.